You don’t only want to change your web presence, you want to enhance it to more languages? 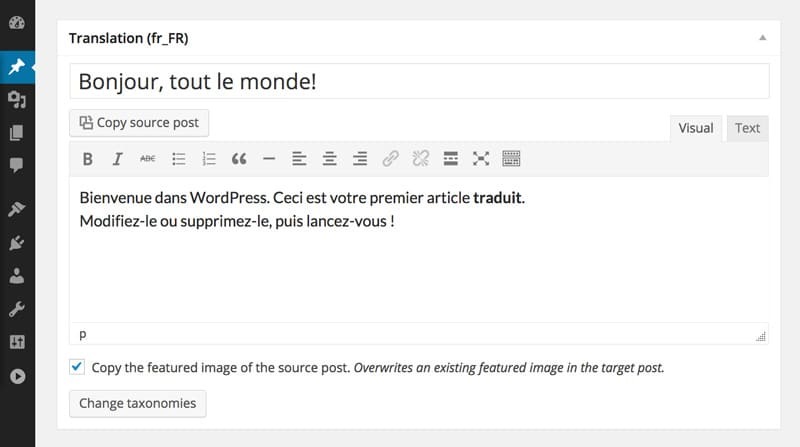 Maybe you already have a multilingual website but want to use WordPress as your future CMS? Therefore you wonder whether WordPress works with your multilingual website? We can assure you that it will work out perfectly! With the WordPress multilingualism plugin MultilingualPress being created on WordPress’s multisite basis. In the following, you can find a detailed description of its functionalities. There are several things you have to consider before publishing multilingual contents on the web. But what you shouldn’t need to think about are all the technical aspects coming along with a multilingual website. Especially when your content gets more complex, WordPress should still be a tool that can be used easily. That’s why we use, as basis of our plugin MultilingualPress, a powerful WordPress Core Feature: The WordPress multisite. On this basis, MultilingualPress enables a whole network of sites in different languages. Of course, all sites can have a relationship to each other. As soon as you work on a post or page, MultilingualPress provides a separate editor for each linked language. Of course you can translate custom post types, too. Translate whatever you want! You can decide! You engaged a professional translator? Create a user profile in WordPress and assign individual writing rights on language basis. Each time you save a new draft in a language, MultilingualPress creates another draft in each linked language within your network. Then all your professional has to do is opening his or her dashboard, where he or she finds the content that needs to be translated. When translating your menues, widgets and other WordPress components of your website, you stay extremely flexible. That’s because all languages you created as page are just that: separate pages within your multisite network. MultilingualPress interacts with all changes you made on your sites very carefully. It’s not getting active until it found translated “siblings”-posts, -pages or custom post types. For example, you could add a widget to your English site showing the latest blog posts. When you add the same widget to your French site, it will show, of course, the latest posts of your french blog. These could be translations of your English posts. Or not – just as you want to have it. Media in the WordPress media library: “A picture can tell more than thousand words”, states a German saying. But does a picture say the same thing in each language? A picture you chose to illustrate something for your English readers needn’t necessarily have the same meaning for your readers in not-English-speaking countries. And a video in Portugese on your German website would make more sense with German subtitles? MultilingualPress enhances your flexibility concerning the cultural aspects of translations, because it keeps the seperated media administration within WordPress multisite. Indeed: That means that you have to upload each picture for each language site and perhaps you need to save several versions of the same picture. But think about it: It’s a feature. For everything else we have a sophisticated checkbox to copy your picture to the other language sites within your network. Work on several language posts at the same time – that’s possiblewith MultilingualPress. Pictures can be copied into other languages individually and uncomplicate. You’re interested in a multilingual project with Inpsyde? Contact us!